Clin Cancer Res 2014 20, 3849-61. Cediranib (AZD2171) purchased from Selleck. Representative histological tumor sections with CD31 vascular staining (brown) and hematoxylin nuclear counterstain (blue) from the 4 treatment groups(untreated, quinacrine, cediranib, ced+quin). Discrete staining is associated with vascular endothelial cells, whereas more diffuse and variable staining is nonspecific and associated with tumor necrosis. Microvessel examples are marked by arrows. Neuro Oncol 2013 15, 1673-83. Cediranib (AZD2171) purchased from Selleck. (A) Representative LC3 Western blots obtained from 4C8 cells grown under normoxic (20% O2) or hypoxic (0.5% O2) conditions for 10 h while untreated or exposed to cediranib (3 uM), quinacrine (0.8 uM), or combined cediranib/quinacrine. (B) RFP-LC3-expressing 4C8 cells were visualized using EVOS fl microscopy, grown under hypoxic conditions for 24 h while untreated or exposed to cediranib (2.5 uM), quinacrine (2.5 uM), or combined cediranib/quinacrine. (C) Representative cleaved caspase-3 Western blots obtained from 4C8 cells grown under normoxic (20% O2) or hypoxic (0.5% O2) conditions for 72 h while untreated or exposed to cediranib (2 uM), quinacrine (2 uM), or combined cediranib/quinacrine. Inhibition of P-gp and Bcrp by cediranib. Accumulation of [3H]vin-blastine in MDR1-transfected cells and [3H]prazosin in Bcrp1-transfected cells in the presence of increasing concentrations of cediranib ranging from 0 to 40 μM is shown. J Pharmacol Exp Ther 2012 341, 386-395 . Cediranib (AZD2171) purchased from Selleck. Ba/F3 cell lines expressing the recombinant TEL/kinase domain fusion protein for FGFR1-4 .Cells were grown in RPMI 1640 containing 10% FBS and 500 ng/mL puromycin. The parental Ba/F3 cell line transduced with an empty vector was grown in 10 ng/mL IL-3 (R & D systems). Cell viability was assessed at 72 hours using the Cell Titer 96 Aqueous One Solution (Promega). Data were plotted as percent viability relative to vehicle-treated cells and are shown as mean (±SD) from 3 experiments. Dr. Mikhail Menshikov of Cardiology Research Center. Cediranib (AZD2171) purchased from Selleck. Cediranib is dissolved in DMSO at a concentration of 10 mM. All enzyme assays are run at, or just below, the respective Km for ATP (0.2 - 30 μM). 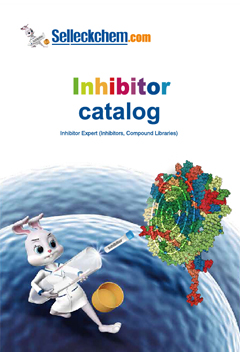 The inhibitory activity of Cediranib is determined against a range of recombinant tyrosine kinases [KDR, Flt-1, Flt-4, c-Kit, PDGFRα, PDGFRβ, CSF-1R, Flt-3, FGFR1, Src, Abl, epidermal growth factor receptor (EGFR), ErbB2, Aurora A, and Aurora B] using ELISA. Selectivity versus CDK2 and CDK4 serine/threonine kinases is examined using scintillation proximity assays with a retinoblastoma substrate and [γ-sup>33P]ATP. Activity of Cediranib is compared to MAPK kinase (MEK), which shows dual specificity. It is determined using a MAPK substrate, [γ-33P]ATP, and paper capture/scintillation counting. Method: The proliferation of the HUVEC cell line is evaluated in the presence and absence of growth factors by measuring 3H-thymidine incorporation following a 4-day incubation period. Proliferation of MG63 osteosarcoma cells is induced by PDGF-AA, which selectively activates signaling of the PDGFRα homodimer. HUVEC and MG63 osteosarcoma cells are cultured in DMEM without phenol red containing 1% charcoal stripped FCS, 2 mM glutamine, and 1% nonessential amino acids for 24 hours. Cediranib or vehicle is added with PDGF-AA ligand (50 ng/mL) and plates incubated for another 72 hours. 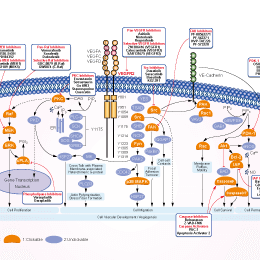 Cellular proliferation is determined using bromodeoxyuridine ELISA. Wedge SR, et al. Cancer Res, 2005, 65(10), 4389-4400. Morton CL, et al. Pediatr Blood Cancer, 2012, 58(4), 566-571.